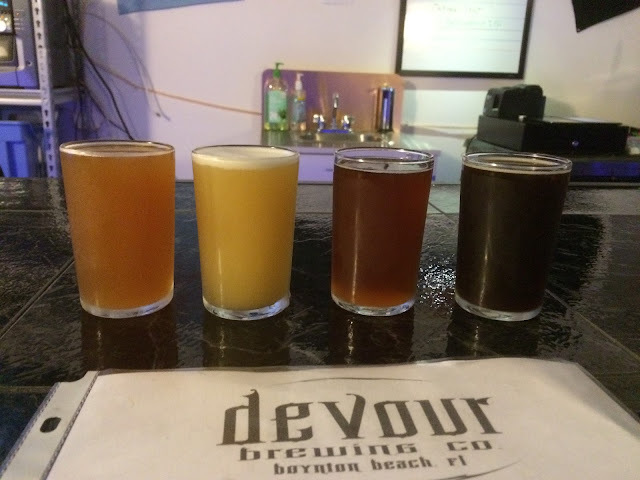 Final stop on #EpicBreweryWeekend was Devour Brewing in Boynton Beach, Florida. This is just a few minutes down the road from Copperpoint Brewing. There was a group playing a game at a table near the entrance. We walked up to the bar where we were greeted by owner Chip and his wife. We asked about our options, and I'm not sure if we did a flight. I think we did four or five half pours instead, but semantics. My favorite was definitely the Coffee and Cream Brown Ale, nicely sweet, creamy, good coffee flavors. Some of the others seemed a little bit in the development stage, with good flavors but some tweeking still needed. If you want to know the origin of the brewery name, it's named after a Shine Down song titled Devour! Thanks for the conversation. Good Luck, Devour Brewing!